Apparently, getting gum massage is the best thing ever. [post_ads]Don’t even bother holding onto your hearts because they’re about to be stolen anyway. Only someone seriously committed to maintaining a grouchy lifestyle could look at this footage of a teething baby hippo and not swoon forever. 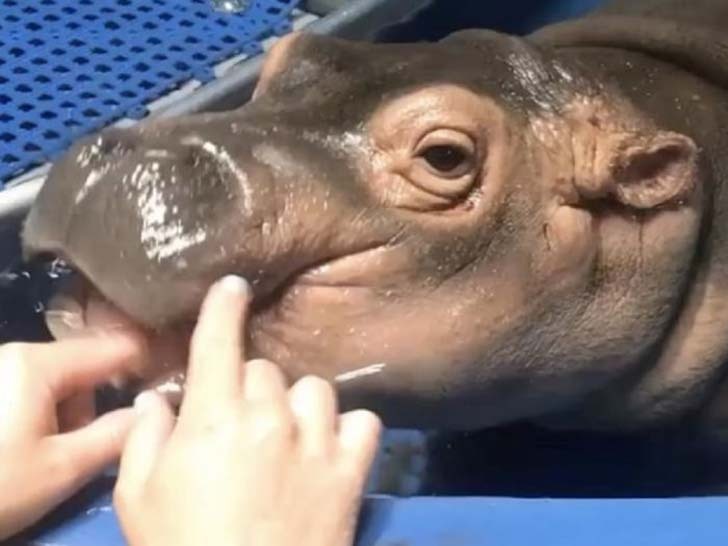 In case you haven’t already made her acquaintance, this heart-stealing animal that ~lurves~ a good, old-fashioned gum massage is none other baby Fiona, an adorable hippo calf that was born six weeks premature at the Cincinnati Zoo & Botanical Garden in January. Since then, she’s been a hit on social media. Thanks to regular updates provided by the staff members who have been instrumental in Fiona’s ongoing progress, we’ve had the pleasure of watching her blossom into a stable, healthy calf. ZOMG, how sweet is she? And how about that coy-but-I-still-know-I’m-cute pose? Hippo slayage, FTW. Just a few months ago, we got a major #FionaFix by watching the precious hippo take her first wobbly steps, and now she’s back to show us how it looks and feels to be treated like a baby queen.